TRIBUTES are flowing for a long-serving firefighter and passionate surfer who died in the water off one of the Gold Coast's most popular beaches this morning. John McNamara has been hailed as a 'very special man' who was a friend to all and 'the most loveable, honest and happiest guys'. Mr McNamara is believed to have had a heart attack before falling into the water and hitting his head on a submerged rock around 4.40am. He was pulled from the water unconscious by his friend but could not be revived despite the efforts of emergence services. Greenmount local Bill Scholer has been friends with Mr McNamara for many years. "Johnny is out here every morning at the crack of dawn and at the first glimpse of light," Mr Scholer said. "He just celebrated his 70th birthday, and even at his age he would always be as enthusiastic as a little grommet to go out for a surf every morning." Mr Scholer said Mr McNamara's family, including his wife, two children, and 11 grandchildren were "broken" by the news. "He has a big family and they are all so broken," Mr Scholer said. "He was the most loveable, honest and happiest guys. "He's had a wonderful life and it's very sad to see it come to an end." John McNamara retired in 2013 after 39 years and 10 months of service at the Coolangatta-Bilinga Fire Station. 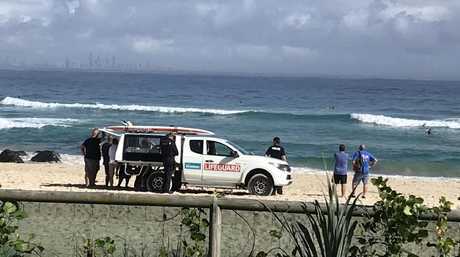 EARLIER: A SURFER has died at one of the Gold Coast's most popular beaches this morning in what has been called a 'pre-Christmas tragedy'. The 70-year-old man was understood to be paddleboard surfing with a friend off Snapper Rocks at Greenmount Beach when is understood to have had a heart attack, causing him to fall into the water and hit his head on a submerged rock. The surfer's friend noticed he had not resurfaced, before pulling him out of the surf to find him unconscious. His body remains in the sand in the arms of his wife and is surrounded by friends. About 8.15am a Hearse arrived at Greenmount to remove the body from the sand. Emergency services took a stretcher onto the sand while more than 30 distraught friends and family of the man watched on. 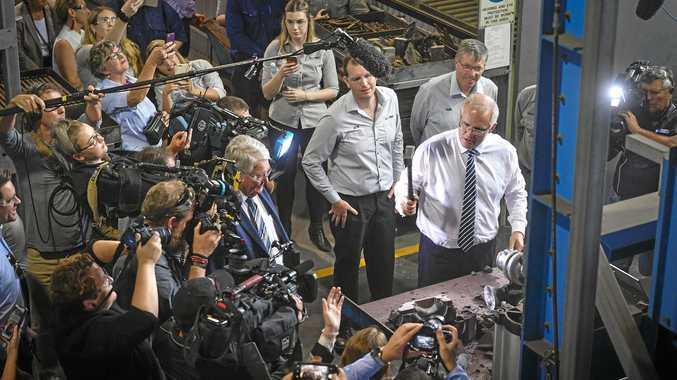 The man is understood to be a well-known figure in the southern Gold Coast community. About 100 people clapped and cheered in celebration of the life of the man as the hearse left the scene just before 9am. A police officer was seen shaking hands and hugging some of his mates. Four young adults arrived just before the hearse drove away and had their last moments as they hugged the man's body and said goodbye. #Greenmount beach Paramedics on scene reported post immersion in surf. Dozens of people have gathered on the beach where the body laid for hours are being pulled out of the surf. Emergency services received a flurry of calls from 4.42am when the man was pulled from the water unconscious. Acting Gold Coast chief lifeguard Chris Maynard told the Gold Coast Bulletin this morning that the man was found floating face down in the water. "It is quite a tragedy at this time of year," he said. "Any incident in the ocean is a tragedy."